Over the past two years, my wife has renewed her love of baking and, as such, she’s done the majority of it in our household. But tonight I am in the kitchen. Ever since I started this blog, I’ve had this post in mind. Or rather some version of it. I didn’t quite know how to broach it though. I wasn’t planning on writing a post at this time, but the inspiration came to me thanks to my time in the kitchen. 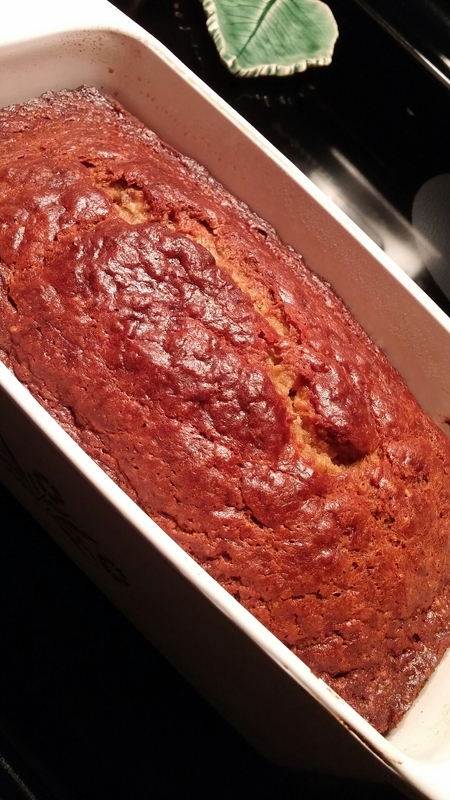 We had a few remnant bananas that were quite ripe, so I thought I’d make a banana bread. When I went to grab my cookbook, I saw another cookbook – my grandmother’s. Shortly after my mémère passed away in 2014, I picked up her cookbook. Some of my fondest memories as a child were being in the kitchen with my grandmother baking something or other. She’d always let me sneak some raw dough trimmings from a pie crust, or give me tastes of cookie batter or frosting as she baked. My grandmother always had some kind of baked goods in the house. That’s what grandmothers do, right? When I brought the cookbook home back in June 2014, I couldn’t help but laugh. My grandmother was a frugal woman. She made use of whatever she could find in some form or another, and her cookbook was no different. Rather than purchase a notebook or actual blank cookbook, she used an agenda/daily planner. Her indexes consist of listing the recipes and indicating on which day they’re found. Very cute indeed. The cookbook itself is chock full of some of my favourite recipes, including the banana bread that I was making. Rather than use my own copy of the recipe, I opted to take out Mémère’s cookbook and follow along with hers. Soon, I was staring into a big, beautiful bowl of banana bread batter. After pouring it into the loaf pan and tossing it in the oven, I couldn’t help but give the bowl a little scrape and a taste. First flashback moment. I suddenly found myself at my grandparent’s home, standing in that oh so familiar kitchen. It didn’t last long, but it was enough to put a smile on my lips. A short while later, as the bread began to cook, I had the second flashback moment when I got a whiff of the delicious banana bread from the oven. Once again, I was whisked back to that same kitchen, standing there at the counter along with my grandmother as she baked. In that moment, I knew that she was with me. Not a day goes by that I do not miss that woman with all of my heart. It brings so much joy to my heart to know that whenever I need to feel her presence, I just need to take out that cookbook and start baking something. There are so many other childhood memories hidden within the pages of this cookbook. I look forward to many, many more visits to Mémère’s kitchen.